Purchasing an Origin PC, be it a desktop or laptop, is a “boutique” experience. Throughout the entire process, you are in complete control over the components, colors, the finish, and you even have the option to have your computer shipped in a big wooden crate. A crate that requires a power tool to crack open (see below). I’m reviewing the company’s EVO17-S (See it at OriginPC.com), which falls into the its “thin and light” product lineup. It’s similar to the EVO15-S I tested earlier this year, but bigger and more powerful. Origin offers several different colors for the backside of the lid. The white lid on my review unit is unapologetically bright and seemed to stay clean during my time with it, but it adds $175 to the cost of the laptop. Other color options range from red with flames to custom paint jobs that require a consultation with the Origin team to receive a quote. When you open the lid, you’re greeted with a 17.3-inch 1080p 144Hz display, a full-sized keyboard with per-key RGB lighting, and a trackpad with a fingerprint reader tucked into the top-left corner. Just under the display, in-between the hinges, is a raised shark fin-like design that wraps around to the bottom of the laptop, and goes from gray to red, that breaks up the otherwise boring LCD housing. I’ve never been a fan of placing fingerprint readers in a laptop’s trackpad. The small cutout for the reader gets in the way when I would just drag my finger around sometimes, especially when I was dragging documents to the Recycle Bin. However, gamers will likely use a dedicated mouse, so the fingerprint reader is a convenient feature to have that likely won’t impact usability very much. With an Origin laptop, one thing you’re never short on expansion ports. With the EVO17-S, there are a whopping 14 ports. From back to front on the left side of the housing is the charging port, an HDMI port, two MiniDisplay ports, a USB Type-C port, and two USB USB 3.1 Gen 2 ports. The right side is nearly as busy, with an Ethernet port, two USB 3.1 Gen 1 ports, an SD Card reader, and three audio ports. Despite being just under an inch in total thickness, the EVO17-S weighs 6.6-pounds, so it’s thin yet big and heavy (not too surprising for a 17″ laptop). In total, it measures 16.4 x 11.2 x .98-inches. The review unit Origin provided me with is fairly loaded. Under the hood is an Intel Core i7-8750H six-core CPU, 16GB of DDR4 RAM, a Nvidia GeForce GTX 1070 GPU, a 500GB SSD, and a 2TB HDD. The rough total for this particular build is $2,288 when I run the configuration through the order page. The purchase price can vary – up or down – depending on the components you ultimately select. And if you find you want to upgrade components down the road, you can either do it yourself or ship it back to Origin. By my count, there are only three “extra” programs pre-installed on the EVO17-S: Origin Control Center 2.0, Thunderbolt Software, and Sound Blaster Connect. The Thunderbolt Software is used to control any Thunderbolt peripherals like an external hard drive or display. Sound Blaster Connect is where you can adjust and customize the sound quality coming out of the EVO17-S speakers, as well as headphones and any connected speakers. To control things like fan speed, view system stats, and tailor the keyboard’s backlight, you’ll need to use Origin’s Control Center 2.0. The main page of Control Center lays out current system stats, GPU and CPU load, temps, and memory usage. You can create custom fan speeds based on CPU and GPU temperature, which is something I haven’t seen on many gaming laptops, so it’s appreciated. Controlling the keyboard’s backlight is found in the “LED Device” pane — a weird name, if nothing else. Once there, you can create your own custom profiles, assigning specific colors to individual keys or groups of keys, or use one of Origin’s preinstalled profiles. Overall, Control Center 2.0 is somewhat easy to use, as long as you are willing to click around and figure out what some oddly labeled buttons do. It’s commendable that Origin doesn’t load up the EVO17-S with unnecessary bloatware, even though many of its competitors continue to do so. It’s one of the pleasant “features” of going with a boutique builder as opposed to “big box;” no bloatware. The first thing I did with the EVO17-S was run it through a series of benchmarks. The EVO17-S more or less kept pace with the similarly the spec’d ASUS ROG Strix Scar II, and the Acer Predator Helios 500 equipped with an Intel Core i9-8950HK. Overall the Origin hung with the big boys, and even though it wasn’t the outright fastest other than in PCMark 8 by a few points, its performance was on par with the other high-end laptops I’ve reviewed recently, which is expected. More importantly it shows there’s no glaring deficiencies in either its software or hardware. Playing Fortnite on epic settings across the board results in a steady frame rate of 110-120. After running the official benchmarks, I installed Fortnite and Call of Duty: Black Ops 4 to see what its “real world” performance was like. Playing Fortnite on epic settings – the highest possible – resulted in a steady frame rate of 110-120 frames per second (FPS). As for Black Ops 4 and it’s more convoluted graphics settings, I experienced a steady frame rate between 90 and 100 FPS. Slightly lowering graphics settings will get you closer to the 144Hz display’s capabilities, of course. Both games were buttery smooth and I enjoyed playing them on the 144Hz display. It has plenty of brightness, and despite being “just” 1080p, it was crisp, thanks in part to a lack of over-saturation. The cooling system is loud, but thankfully the sound system in the EVO17-S is one of the better sounding, and loudest, I’ve experienced. I had no problem hearing footsteps or vehicles off in the distance even with the fans spinning at full speed without headphones. I did notice that just above the keyboard on the left side the housing gets hot to the touch. It was hot enough that leaving my hand on it for a few seconds got uncomfortable, but luckily there’s no reason to ever do this. I enjoyed the keyboard on the EVO15-S, and the same holds true for the EVO17-S. Its responsive keys were great for both intense battles and for typing. I do wish, however, I could import lighting profiles to highlight specific keys for different games so that I could take full advantage of the per-key lighting (a rarity on laptops). One minor hiccup I ran into shortly after powering up the EVO17-S for the first time was that one of the fans would constantly spin. It didn’t matter if the lid was open or closed, or if the power adapter was in use or the laptop was on battery power, the fan never stopped. Ultimately, I changed the Power Plan to Windows 10’s Balanced profile, instead of the default Origin profile that comes preinstalled, and the fan behaved normally. This wasn’t a show-stopping issue by any means, but something to be aware of should you run into a similar issue with the EVO17-S.
Having a 500GB SSD as the main storage drive is handy. Having a 500GB SSD as the main storage drive is handy. After installing just a handful of games and benchmark apps, the seemingly standard 256GB SSD that most gaming laptops ship with inevitably fills up, and you’re left trying to manage storage on your brand new laptop. Baseline storage of 500GB should be the starting point for a high-end gaming laptop. Origin advertises up to seven hours of battery life for the EVO17-S on its website, but my test result, as is usually the case for any laptop (gaming or not) fell short of that mark. The EVO17-S powered through 98 minutes of use while looping a 4K video using VLC Media Player. Battery life just under an hour and 30 minutes isn’t terribly impressive, but it’s slightly better than the ASUS ROG Strix Scar II and the ACER Predator Helios 500, with 80 and 91 minutes, respectively. You can order the Origin EVO17-S as configured on the Origin PC website, or you can customize it to your desired specifications. 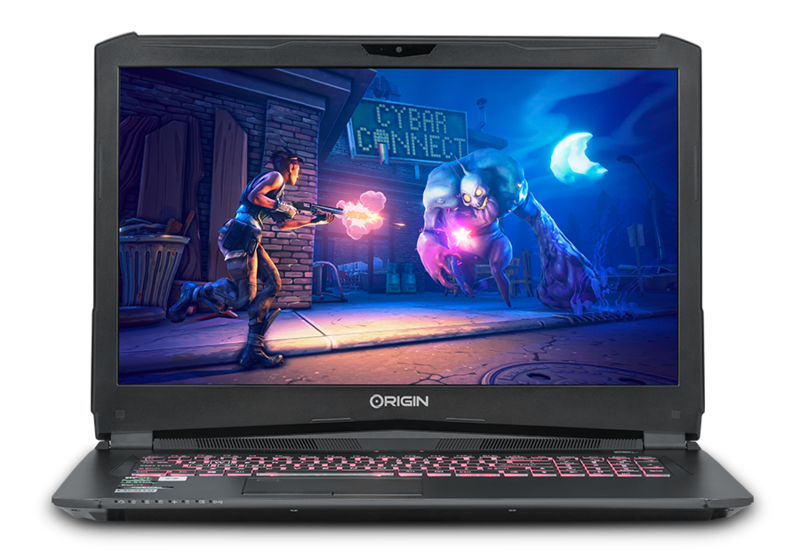 The Origin EVO17-S is a great gaming laptop. It has no issues running AAA titles or hammering out assignments for work or school. With a sizable number of customization options, the EVO17-S can fit a wide range of budgets and gaming needs too.